This card is very good for restaurant, dining, entertainment and grocery purchases. 3% cash back on dining & entertainment purchase, 2% cash back on grocery purchases are very good rates. Low Cash Advance and Balance Transfer Fee. The bonus amount is not very attractive. 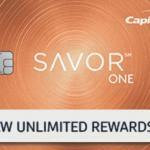 Capital One SavorOne Rewards Credit Card is similar credit card with Capital One Savor Rewards. The card has many advantages for consumers who wants to have credit card for dining, restaurants and entertainment. You are going to earn 3% cash back on your dining and entertainment purchases with this card. You are not going to pay interest rate for 15 months except cash advance. There is also no foreign transaction fee for the card. Rate of balance transfer and cash advance fee is 3%. This is very good amount for consumers. There is also no annual fee. There is almost no downsides of SavorOne Rewards, cash advance APR is reasonable when you compare it with other similar cards. However 25.74% is always a high rate though. So we recommend you to avoid cash advance with this card. 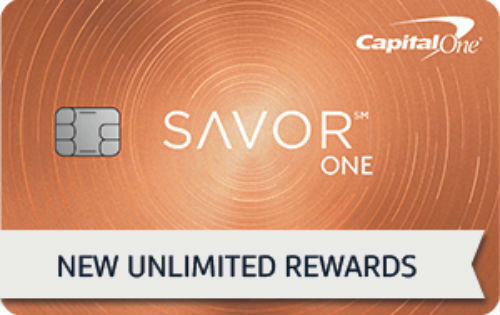 You can check rates & fees of Capital One SavorOne Rewards in the table below. There are also editor scores which we prepared with our own algorithm. We recommend you to avoid credit cards which are below overall score. 16.74% or 22.24% or 25.74% 3% unlimited cash back on dining and entertainment purchases. 2% unlimited cash back on grocery. 1% unlimited cash back at all other purchase categories. User reviews are very important at rankings of credit cards on our website. If you like or dislike this card please let other consumers know.